Valley Blooms was created in 2015. 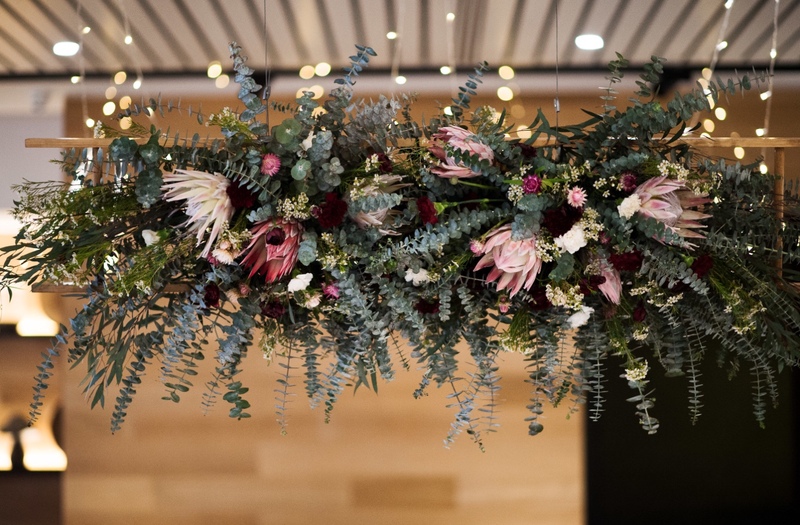 After 10 years in the floristry/horticultural industry, 2 young girls were fed up with the workplace they were in and decided to take the leap and design a freelance floristry business to cater to all design aspects and take flowers to new heights. Bored at the traditional styled florist shop they came from they created an industry of its own league. Hanging florals from anything and everything possible, allowing couples to dream bigger and reach their flower goals for their special day. "We offer a full range of services in order to allow the dream to become a reality. Including all floral designs such as bouquets, buttonholes, flower crowns and more. As well as the stylings aspect of your venue including archway florals, table arrangements, aisle flowers, and all the way up to being capable of hanging/suspending florals from a ceiling to chandeliers to beams to flower hanging bombs, and more using scaffolding, harnesses, ladders and whatever other equipment required to complete the job. Delivery is a service we offer to couples anywhere in Victoria in order to allow them to relax and get ready on the day with hassle free service and a range of set up options including even sometimes setting up those last minute details such as placement of name cards, the odd candle or 200, lanterns or anything down the aisle, ask us first before you pay extra with a venue or wedding planner to see what we can do for you as a simple extra hand on the day seen as we are there setting up anyway with our flowers. As well as our full support leading up to the event and also recommendations on the most prestigious suppliers that we trust! You'll receive our full dedication to the day and genuine excitement for anything and everything love with a styling service and advice from people who have created and contributed to over 600+ events. Jess - I couldn’t imagine myself working in any other industry, Confucius said if you love what you do you will never work a day in your life although almost deterring from bullying from my past job in the industry, I almost quit but persisted and am now the founder of Valley Blooms. My aunty was a florist and I remember helping her in her store at a young age of 4 onwards. I started work in the industry at the age of 13 and needed parental approval as I wasn’t actually old enough to work legally yet but couldn’t wait to get started and begin my journey. Valley blooms was created as a way for us to continue to do what we love after leaving our past employment under duress due to work place bullying. Now we get to do what we love it in a safe environment that is full of joy and happiness in order to feel the love in every moment and share this with as many people possible. Jemma - I started floristry as a first job and after being apart of doing the events I realised it was what I preferred to do. I love designing the flowers the most & I like doing floristry and creative work. 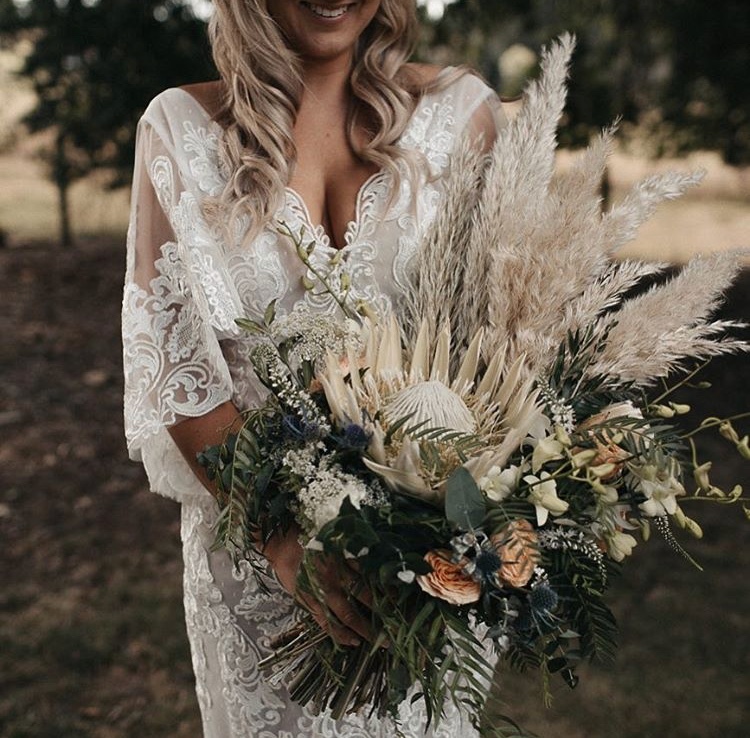 After meeting the clients such as Brides, Grooms and their families, some of the fur variety and some of the people variety, you grow with the excitement that they have towards their day and the reason for the day- that they love each other so much. I fell in love with being able to contribute to their happiness through flowers and here we are sharing the love and doing super cool designs and crazy creative hanging displays for couples’ special day and other functions and events. ➳ Do you have any classic stories that you would like to share from your experiences? Oh well, if the van could talk, the Valley Blooms Machine could tell some stories! We often need to travel for some epic destination Weddings. This generally requires Jemma and I to be in each other’s presence in a small van for hours of driving across country. Which is always entertaining. We have camped in the van on multiple occasions including trips to places like Milawa, Mornington, Lorne, Acheron, Mansfield, Goulburn valley, Yarra ranges and Dandenong area, Melbourne city and rural private properties anywhere from Albury to Kangaroo Grounds and more. Our Milawa trip may have been the most disastrous of all, as upon planning and researching Jess made the rookie mistake of misspelling the location name into google maps and was researching a Hawaiian beach for months by mistake. Only to discover the area is rural and not quite a beachside paradise as we had packed for. We also under estimated the time it would take us and arrived a day earlier then we had planned due to this lack of research on the actual area. I guess it means at least we were not late but no accommodation was booked and we arrived at midnight lol. Luckily with enough persistence we woke up a motel staff member and managed to beg for a room which only happened after explaining we would otherwise be sleeping on the street with all of our flowers!! Thank god for the kindness of human beings the day was saved and the event was a success. Jess will never forget or live this down - it was way too funny. ➳ What advice would you offer to a couple that is just starting out on their search for the perfect Wedding floral designer? Choose your suppliers wisely. Always remember to take time to yourself to enjoy the planning process, as this should be a joyous experience as you are planning the celebration of 2 human beings who love each other unconditionally and equally. We think the fact that we seem to surprise people is the best part about what we do. Jess is a tiny human and no one expects her to do what she does in the way of climbing, hanging designs and suspending them from a beam 3-4m high in the air while on a harness or ladder. Classic moments from our exepriences thus far would have to the looks that we get bringing our equipment in with just the 2 of us no one ever expects us to get it all done in an efficient, effective and tidy manor. For example our giant stick arch way needs to be set up every time we hire it out due to it not fitting in the van assembled. It comes in pieces like a puzzle, Jem and I can assemble it within 20 minutes and its huge. Then we need to add flowers and this is where Jess shines in creating her designs fresh and freehand onsite which always match perfectly in to the environment surrounding the design and compliment every negative space while making venues glow. Also, the looks on the road while driving the van with multiple archways, ladders and equipment on the roof racks of the Valley Blooms Machine are hilarious, some people cannot wrap their heads around the fact 2 little girls can use those items for floristry when it would seem more for tradies until they see the end result. We are super proud of being capable to design these creations that are unique to each couple and their individual requirements – all the factors are considered when planning, we love it. And then to see the end result is everything. Especially when the clients are blown away and love it all just as much as us if not more. That’s the best part.